Cartoon Companion is back with their deep-ish takes on every cartoon in the latest issue of the New Yorker (May 28, 2018). Charlie Hankin is awarded the CC’s “Top Toon” ribbon. Read it here! Mr. Hankin has been contributing to The New Yorker since August of 2013. Link to his website here. 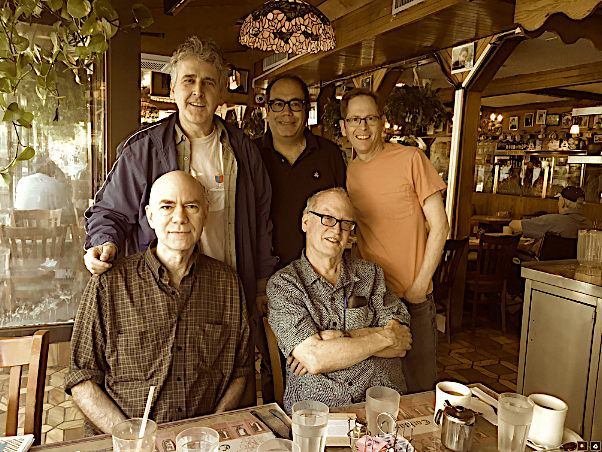 Five New Yorker cartoonists today in lower Manhattan: clockwise from top left: Bob Eckstein, Ken Krimstein, Robert Leighton, Nick Downes, and David Borchart. Mr. Eckstein has been contributing to The New Yorker since 2007; Mr. Krimstein since 2000, Mr. Leighton since 2002; Mr. Downes since 1998; Mr. Borchart since 2007. Gayle Kabaker‘s charming cover kicks off summertime ’18 (you can read about the cover here). Just for fun I’m showing the cover of every last issue of May from 1925 through 2015, one from each decade. And now to the new issue. I’m going to mention just one drawing from this issue (if you want critical writing on the cartoons I suggest you head over to Cartoon Companion, where each drawing is discussed and rated from 1 – 6). Charlie Hankin’s drawing (it’s on page 61) reminded me of Jack Ziegler’s work. That of course is a very good thing. Mr. Hankin gives us a lovely (and large) drawing of the Metropolitan Opera House — obviously there’s more to it than that; you can see it here, along with all the other drawings in the issue. Mr. Ziegler’s was a cartoon world created to amuse himself; his way-out-there graphic and humorous takes on just about everything were his cartoon calling card. It’s good to see someone (Mr. Hankin in this case) give us such a fun drawing to look at and live with. Finally, some paperwork. 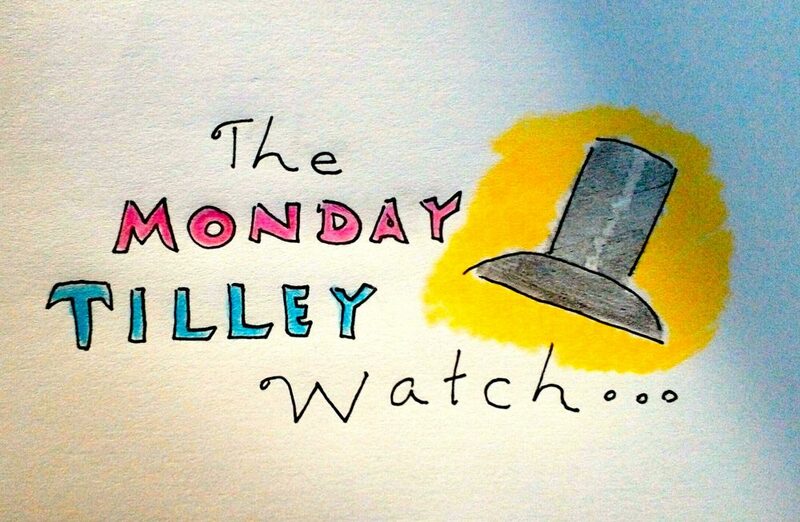 A new cartoonist in this issue: Jessica Olien. If my record keeping is correct, Ms. Olien is the 15th new cartoonist — the 4th this year — brought on board since Emma Allen took charge of the magazine’s Cartoon Department in May of 2017. You might notice a co-credited cartoon: Kaamaran Hafeez and Al Batt. It’s not the first time a cartoonist has shared credit with a gagwriter, but it’s still a rarity. The latest issue is themed: The Mind Issue. Don’t mind me if I zip through the issue this week. 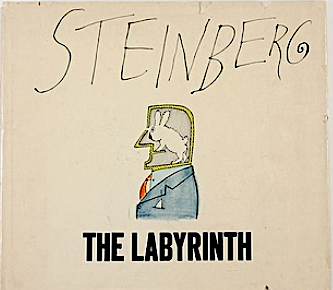 Seeing the cover pop up digitally this morning I immediately thought of Steinberg’s 1961 collection,The Labyrinth (I also thought how much I dislike seeing drawings of or photos of brains. Squeamish, I guess). This type of a cartoon-look-inside-the-head drawing goes way back — I know I’ve seen an animated version or three that were likely produced in the 1930s or 40s or earlier? Animation archivists would surely be able to pinpoint the dates. A quick aside: thinking that Steinberg had done a cover using the cartoon-inside-the-head device I ended up looking through decades of New Yorker covers this morning. It was a blast spending time with The Complete Book of Covers of The New Yorker: 1925 -1989 (Knopf, 1989) taking in the art and artistry. And now to the cartoons. The words “thinker” and “thought” appear in the first two cartoons of the issue (Tom Toro’s and Bruce Kaplan’s, in that order), thus somewhat tying them into the issue’s theme. After that the cartoons are mostly on their own, as usual (although the Frank Cotham drawing, on page 65, does have “think” in its caption). Charlie Hankin’s The Thinker cartoon (ah, another one tied-in to the issue’s theme). I do wish this was allowed a bit more space on the page; Rodin’s man looks squeezed in there. Seth Fleishman’s long ago subway drawing (and there it is: this week’s subway drawing!). I like that it was allowed to spread across the top of the page. Peter Kuper’s witch-or-not-a-witch drawing with its subtle throwback to John Held Jr’s wood cut style (it also, of course, recalls this unforgettable scene from Monty Python’s Holy Grail. For more reading on each and every cartoon in this issue be sure to check out the Cartoon Companion. They usually post their rated takes by Thursday evening. The cat, or, uh, cover’s been outta the bag for several days now, so we can move right on to the cartoons in the issue. (I’ll mention Rea Irvin‘s missing masthead later on in this post). Roz Chast has the first drawing (p.19). The setting of several folks lined up on a sofa hard up against a wall seems to belong to her. It’s her signature, as much as George Booth’s guy-in-the bathtub scenario is his. Six pages later a Zach Kanin cozy-under-a-blanket-by-a-fire drawing (coincidentally, the action in the drawing is set on a sofa). The cartoon is anchored by the use of the word “breasts” in the caption. 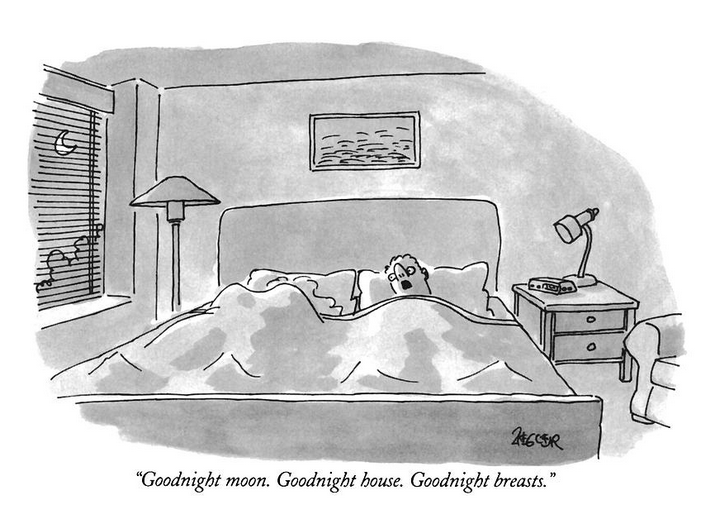 A quick online search shows a modest number of New Yorker breast-related cartoons, with very few actually mentioning breasts in the caption. One that came readily to mind is this classic courtesy of Jack Ziegler from November of 1997. Nine pages later, a fun Seth Fleishman drawing (captionless, of course. His specialty). Succinct clean lines and ideas. The same could be said for the very next cartoonist: William Haefeli. Unlike Mr. Fleishman, he works with a caption. This particular drawing is textbook Haefeli. Even the inconsequential fruit in the bowl (in the foreground) is rendered as if it is essential to our grasp of the entire piece. On the very next page is a grand drawing from Charlie Hankin, well-placed on the page. A crime scene by P.C. Vey is on the opposite page. I love how he’s drawn the victim. This compact set of drawings is one of my favorites in quite awhile (the set consisting of Fleishman, Haefeli, Hankin, and Vey). Three pages later a well-drawn Tom Cheney cartoon (is there any other kind?). NYC apartment seekers who don’t have money to burn will find this drawing especially hilarious. On the very next page, Emily Flake brings us a demographic not often seen in the magazine: senior citizens. It appears the fellow’s had enough and is taking a walk. He can’t be planning on being away very long: he has no coat or jacket, and just one piece of luggage not much bigger than a bowling ball bag. The last drawing in the issue (not counting those on the Caption Contest page) is by Edward Koren, who will, this May, celebrate his 56th year of contributing his drawings to The New Yorker. No one draws birds like Mr. Koren, and, need I say it (sure, why not) — no one draws like Mr. Koren. Link here to see all of the drawings referenced in this issue. And don’t forget to check out The Cartoon Companion (they usually post at week’s end) for their rated take on all the issue’s cartoons.